Even though their original tenure as a band spanned less than a decade, the lasting influence of Moncton lo-fi band Eric’s Trip is examined in A Distorted Revolution: How Eric’s Trip Changed Music, Moncton, and Me, the first book from Moncton author Jason Murray. 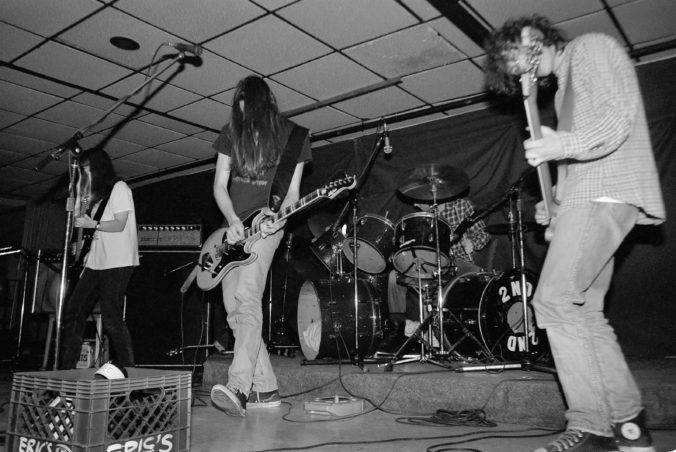 Formed in the early part of the 90’s, Eric’s Trip were the first Canadian act signed to the Sub Pop label, the original home of influential acts like Soundgarden, and Nirvana, among many others. The group’s non-conventional approach to making music – the bulk of their studio output was recorded at home – earned the group a dedicated fan-base that spanned the globe before the band parted ways in 1996. Although the book charts the formation and eventual dissolution of Eric’s Trip, the book isn’t as much an official biography on the band as it serves to symbolize the vital, vibrant underground music scenes that inhabit countless cities and towns all over the world. As an observer, Murray acknowledges it was hard not to get caught up in the excitement, and do-it-yourself attitude that was swirling around Moncton in the early 90’s. In the book, Murray relates how the culture of skateboarding – very much an outsider past time in the late 80’s and early 90’s – and the music of The Ramones, among others, helped to unite a subset of teens that were uninterested in almost any respect of the mainstream. As the author would discover, however, this wasn’t a Moncton-only phenomenon. “For the book, I spoke with Keith Morris [Black Flag] and Ian MacKaye [Minor Threat, Fugazi], both of whom confirm what was happening culturally in Moncton in the 80’s and 90’s was happening, or had happened, all over the world. Ian told me, ‘Ideas come from small towns; sales come from big cities,’ which was evident when looking back on the early 90’s, when the microscope was finally cast upon the Monctons and Halifaxes of the world,” Murray says. Since the book was released, Murray has received messages from readers that marvel at the similarities between the story he lays out and what is taking place in their own backyard. It’s that universality and manner in which music brings people together that is perhaps most gratifying to the author.